A blog for the musing and rants about painting, the business of painting, getting old, passing along good stuff, links, tutorials and tidbits. There are 4 pairs of painters. Each painting the other from photographs provided. There are to objectives in this challenge. First assuring that a good photograph is provided and understood. Second objective is managing value and color focusing on spectral color. I added to my personal challenge by selecting Geneva Paint as my palette. 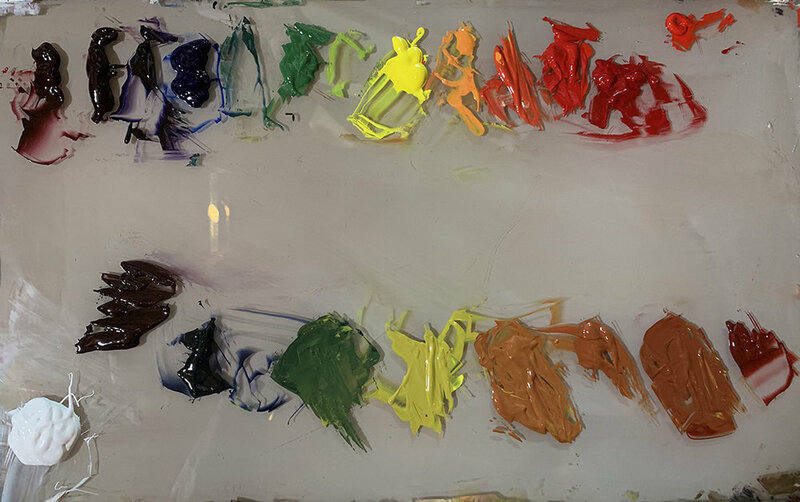 Geneva is a more liquid self leveling paint with a slow drying formula, I started by mixing my 12 color pallet from Ultramarine Blue, Cad Yellow and Pyrrole Rubine. Then mixing set of tertiary semi-neutrals. The painting got it’s start as a half size touch painting on paper. I worked out rough color, value and likeness. I tried to get a handle on the Geneva and groused a lot. The color is good but it hard to handle the paint with an expressive brush. I made a outline “master” from the painted sketch. I projected to sketch to the final canvas. A panel I had made with Raphael linen on wood panel. I had to make a lot of corrections to the features. The Painting took over a week because off the slow dry characteristic of the Geneva paint. It would have been 3 or 4 days using Lukas paints. It is still not finished. Some spots are still wet. Very wet. Need to do a little glazing. All in all I happy with the painting and the experience. This is a continuation of my last post on finding a non-pose pose. The chosen pose. This is week two of over painting efforts. We have a good mix in our group. Johan Sellenraad a long time local artist transplant from NYC. We work in his studio along the Delaware River in Millanville, PA. Johan makes big, Subaru sized, paintings of canvas in a strong confident style full of reference. Judith Reeve paints with a expert feel for the figure and gorgeous approach to color. Over the past several years this has been a tremendous education for me. The simple length of time that we have painted together has allowed me to observe and absorb knowledge and attitude that has helped me along my journey. Please visit their web pages to find out more about Johan and Judith. Johan works on wishing winter's departure. ...how does show keep track of those brushes. My effort after 2 weeks. Working on neutralizing my color views. For most of my life i've worked from photographic reference. That's how we were taught back in illustration classes. Of course Life Drawing was a important part of art school but the vocation thing was working from photography. Your own or more than likely others that you collected and categorized in you personal morgue files. The public library even had morgue reference files that you could search. All to much like office work for me. I abandoned reality for humorous imagination while still in school. Somehow relying of morgue picture wasn't a funny idea. Even though I worked from my imagination, working from photos was a big part of my process until 2012 when I left the work world. The first thing I did was mine my collection of thousand of photos subjects to paint. The second was find opportunities to paint from life. I found a weekly life drawing session that was and hour and ten munites each way. I went every week like clock work. It saved my life as an artist. Since then I've found several other life drawing opportunities closer then the hour ten. Working from life allows you to see in dimension to create and understand space. Every week I paint with Johan Selenradd, Jim McGinty and Judith Reeve. All three incredible and different painters. I learn something new every week, color, composition, space and form. Even the importance of painting just to paint for myself. The above painting of our model Catherine down over two weeks about 4 and a half hours of painting time. We did two posses combined on 1 canvas. Just great fun. It's unfinhed and will remain so. Continuing with the fruits theme here is a Golden Delicious. sitting on top of an old fruit crate. A work in progress of one of my favorite places. We spend a week there every August. One of my other favorite things is windows. I like these windows. I have a bit to do still. Waiting for some of the paint to 'tack-up' for glazing and detail. This is a common scene where we live. The aftermath of local quarrymen chasing the bluestone. I did this with acrylic to make sure it would be ready for the Rittenhouse Square show in early June. All that white would still be tacky ( not really ) and it wouldn't have any varnish. This took 4 days. about 10 or so hours. It's done! Varnish next week and ready to hang. On Sunday it was so freggin' cold that I didn't even want to go out. I went to my studio and tackled this image in a direct manner. This is an image of the last of 20014's Hydrangeas. I had sketched a few of the blossoms before and felt good about winging it. My goal was one sitting. Well to was a little more than that. about 4 and half to five hours. It was kind of fun. Flowers are not one of my often painted subjects. But I needed a small to do between biggish canvases. I like this and may do some more flower paintings soon. The immediate direct painting approach is really what I like. I've been banging away at this for a long time off and on. It just needs to be oiled out in a week or so then varnished in about 6 months. I like it. The idea came from reading how the Victorians would hang their game for a long time until the leg fell off. Then they'd cook and eat. ICK. I shot this bird and hung it in my old tractor barn made up of used lumber. The idea of hanging until the leg falls off is sort of a way of telling time. It was a coincidence that the old wreath frame was behind it. I had to name it Barn Clock. This is a small, very small for me, oil sketch of some clouds rolling over the fields in Bethel NY near my home. This would be part of Yasgur's Farm off rt NY17B. This week at Johan's long pose life daw/paint session we had a new model. Mary. She turned out to very, very good model. It was a brightish day so the light in the studio was good but at time a bit of and on from the clouds. I've posted my images of Soha that did at Johan's where I started the painting in session and finshed in the studio. In this painting of Mary I thought I'd cram that process of probably 6 to 8 hours into one 2 and a half hour session. I had to work fast and make decisions instinctively. No time for a lot of ifs ands or others. I had prepared a canvas ahead of time on which I had applied a gray 'stain' (thanks Mark Carder). Once we had chosen the pose from a half dozen or so 2 minute poses, we got to work. The we is a group of three very talented and accomplished artists from the Upper Delaware area, and me. One day I will make a post showing off there work. I don't carry a lot of colors with me to this weekly session. Every Sunday 12 to 3. Go Pats. I had Burnt Sienna (BS), Ultramarine Blue (UB), Cad Yellow (CY), Cad Red (CR) and Alizarin Crimson and of course Titanium White. Just a few brushes medium sized to big synthetic filberts. I had only my portable tin of OMS (Oderless Mineral Spirits) to use a thinner, medium and brush cleaning. I started out with a washy sienna and blocked in the figure and got some quick tones in. I super roughly sketched in some indication of the pillows and fabric pattern on the sofa. 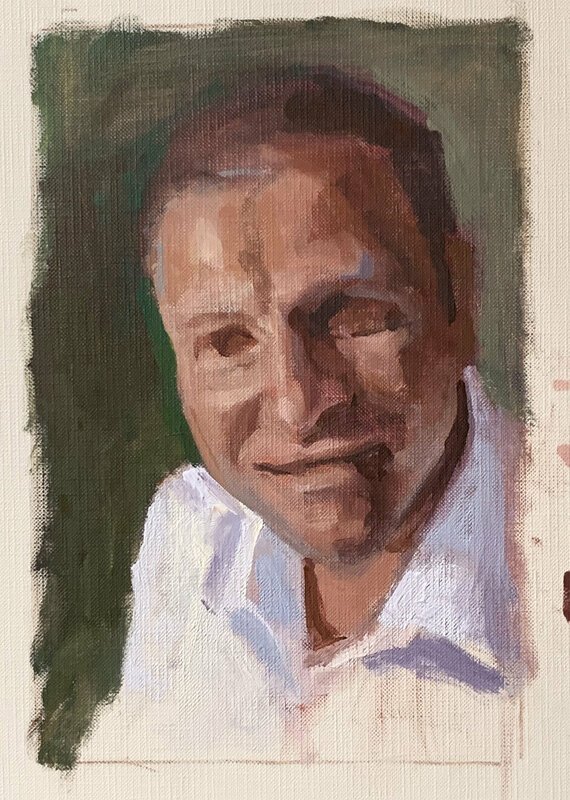 Over the next hour and three quarters with model breaks, one of which included a piece of spinach knish, I glazed on the flesh tones very thinly lightening as I built out from the darker mid tone stain. I have to say the time constraint help force me into a zone. The only thing that stopped me was sore feet. At the end of the session I looked at the other artists work. Everybody's work was outstanding. Judy had done a charcoal drawing that was precise and beautiful. Gloria a mixed media oil and charcoal(?) that would be at home in a story book. Dianne did an acrylic that was wonderfully colored. Johan was well into a giant canvas of a beautifully foreshortened viewpoint in his immediate and whimsical fashion. I feel privileged to be working with such a fine group. SO I did the series of Soha posts earlier. A life sketch improved in the studio from a iPhone snap. The result was a burnt sienna under painter that was okay for painting over. The problem was that in fifty year of painting I'd never done that before. Oh well. So I printed the photon canvas from my epson printer. Put it un a drawer and forgot about it. I had a complex painting ready to go on the easel . I didn't want to be hung up for a week so I started putzing around an d found the print.. I taped it to a board and painted it. It's not done but I'm gonna sit on for couple of days to see if I can find any more boo boos. I like it but I have to give most of the credit to the model Soha. I thought I'd try my hand at smalls a while ago. At 4 x 6 this is about as small as I can get with this type of image. Back when I was doing a lot of illustrations for text book in Boston I did a lot of teeny tiny heads in pen and ink. Some with just a few pen scratches. The most important thing I had to represent was the ethnicity of the pen scratches. I used MGraham walnut oil based paints on this and good sized brushes. Not giant not small. Good size. It went quickly got pinned on the wall and forgotten. Here it is no longer forgotten. I've finished the portrait. I took about a week and a few false finishes but it's done! It was done for the now annual portrait swap challenge on the DMP forum. A group of realist painters and want to be painters. Beginning painters to very accomplished painters from around the globe. This is Denis who is from Australia. He will be painting a portrait of me. When they are dried and safe to ship we will swap the painting by mail. It's a novel but not uncommon thing. Last year I did a portrait of Bill. A woodcarver from Las Vegas. Yesterday the Wayne County Arts Alliance held the annual art auction fund raiser. It was a success. It was held in the Dorflinger Glass factory space in White Millls, PA. I'm happy to say that my painting of a Beach Lake Bakery Rustic Loaf was the first painting sold. That is if you don't count my wife's selection of my friend Ianni's painting that was really first. We also bought two other paintings that we like very much. All tolled we gave the WCAA $1350 in donations and value. We also went to the Metropolitan Museum to see the Cubism show on the last day of the members preview. It was mobbed but what a great exhibit. Simply put it show how the heavyweights, Picasso and Braque developed and evolved the style what so many other have emulated. It also focused on Leger and Gris. Two of the better practitioners. Great great exhibit. To see that show we had to leave early to drive to the city about 120 miles. It was a beautiful ride. the light was just grand. We got to eat in the members only dining room not as pricy as one might think and way better than Honesdale's best. Sorry. The ride home was equally splendid as the sun set over the Borscht Belt of the Catskills. Oh and I can't forget I all but finished a portrait on Saturday morning. Oh yes I now have full sized giclee prints on canvas of the loaf available for $125. This is a painting done for the annual portrait swap on the Draw Mix Paint forum. A loose group of artists from around the country and globe who share an interest in realistic painting. This is Denis who is from Australia. He is doing a painting of me from an image that I selected and sent to hime. There were about 12 participant that so far have produced some stunning painting. When the painting are dry we swap our paintings. Great fun.